❄️ Multifunction - It can be used as fan with high wind,eye-care LED table lamp and spotlight torch. ❄️ Adopts ultra-quiet power motor,you can use more easy. Use high brightness and long lift the wafer chip LED lamp. 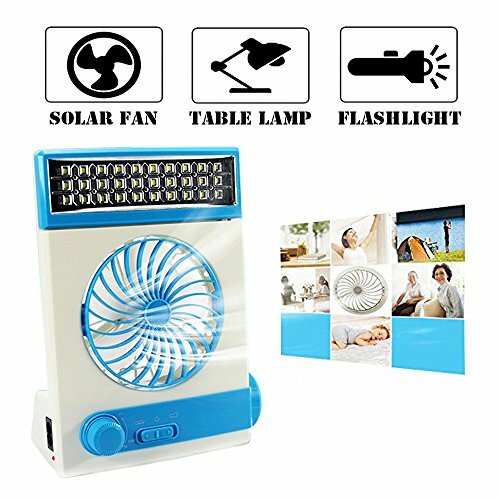 ❄️ Solar light fan is used cery convenient and widely, such as outdoor shade, camping, blackout emergency and transportation. It can also used in the temporary job and the flow of booth without power supply. ❄️ Lamp with plate cover can help you to adjust the angle,Hidden portable design made easy for you to use. At the bottom of the adjusting brackets can also adjust the angle of the wind. ❄️ Double charge design with hidden solar battery charging and mains charing, you can choose as you like. If you have any questions about this product by Ansee, contact us by completing and submitting the form below. If you are looking for a specif part number, please include it with your message.